Since 2003 I’ve been leading an Open Educational Resource (OER) initiative at BCcampus. This BCcampus Open Educational Resource initiative involves all 25 public post secondary institutions in the province of British Columbia, Canada. Over the last seven years OER initiatives have proliferated. As the number of initiatives increase I’ve been following them with great interest and with an eye to compare and contrast them with each other and with ours at BCcampus. I’ve noticed the BCcampus initiative is unique in a number of ways and thought I’d use this post to explore my thoughts about that uniqueness and raise some questions OER. The BCcampus OER initiative differs from most others in that it is sectoral rather than institutional. In the BCcampus initiative OER are produced by all 25 public post secondary institutions in the province. As a sectoral initiative OER are primarily being developed via multi-institutional partnerships involving faculty and staff from more than one institution. Partner institutions each invest in the development of the OER and each use the developed resource. In addition many of the projects have formed partnerships with BC e-learning companies, not-for-profits, and professional associations to support the development effort. This maximizes the use of the resource and works toward the creation of an OER ecosystem within the province. 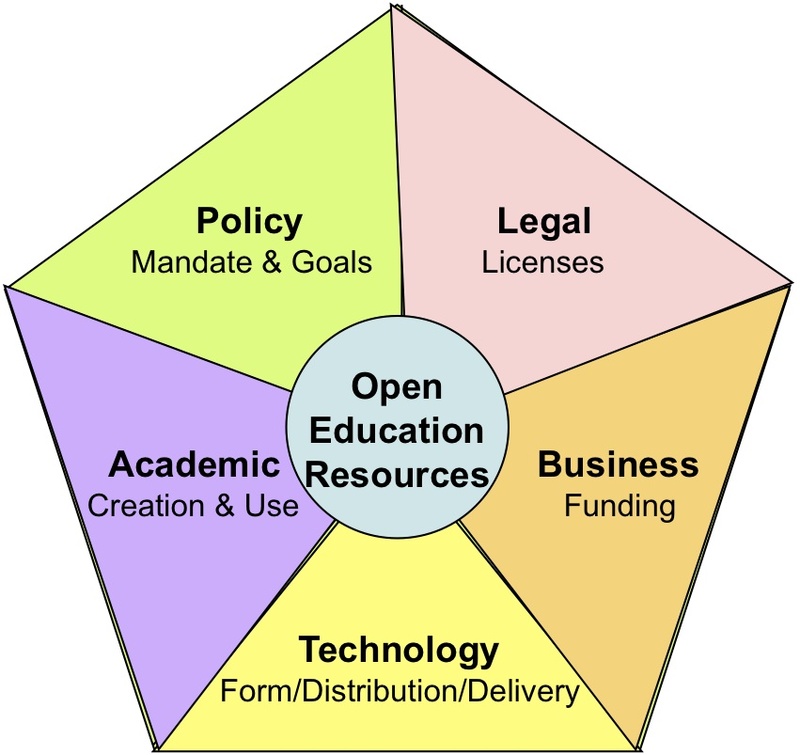 Other OER initiatives such as the MIT’s OpenCourseWare, Carnegie Mellon’s Open Learning Initiative, the UK Open University’s OpenLearn, and others are institutionally based with educational resources being produced from within the institution without partnerships across multiple institutions. Another unique aspect of the BCcampus initiative is that it is funded using public tax payer money provided through the Ministry of Advanced Education. 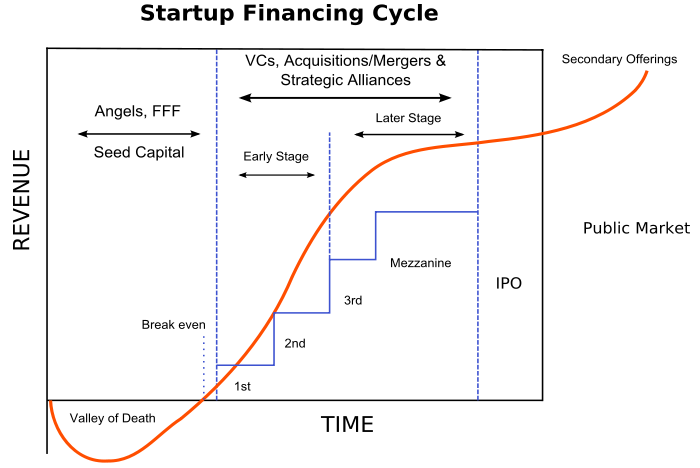 Investment is made annually via a competitive Request For Proposal (RFP) process. As of April 2010 BCcampus has done seven annual rounds of funding representing a total investment of $8.25 million dollars (CDN). Most other OER initiatives are funded through foundation grants including the Hewlett Foundation, Bill & Melinda Gates Foundation, and others. With funding coming from the Ministry of Advanced Education the primary goal of the BCcampus OER initiative is to increase the credential opportunities available to students throughout the province by funding development of post-secondary online courses, programs, and resources. The BCcampus OER initiative targets development at credit based, fully online learning courses in areas of high student demand and labour market need. 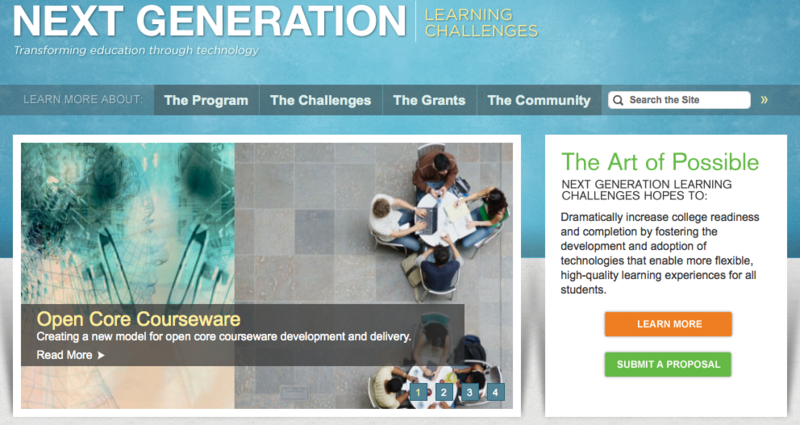 Grants are intended to support curriculum development building out complete online programs leading to a credential. The BCcampus OER initiative is focused on solving a provincial higher education need around credential opportunities and academic completion. I’ve noticed that many foundation supported OER initiatives are not actually seeking to solve academic or credential needs at the institutional or regional level. They are simply creating a pool of educational resources without an applied academic purpose or credential context. Like other OER initiatives the “open” goal of the BCcampus OER initiative is to create a source of digital materials that are available for immediate free use eliminating the weeks and months of time it can take to seek permission to use existing digital materials. Reuse of openly shared online learning resources leverages an initial investment, in this case of public taxpayers dollars, many times over. It also stimulates and supports a culture inherent to education – sharing knowledge and building new knowledge off the work of those who came before you. However, the breadth of the BCcampus OER goals differ from foundation funded OER initiatives. Most foundation funded OER initiatives have a global orientation not a regional one. A goal of the Hewlett Foundation OER grant program is to “Equalize access to knowledge for teachers and students around the globe through Open Educational Resources.” For some there is a moral and ethical imperative around the open sharing of educational resources globally based on a recognition of the world wide shortage of education. Globally open OER increases access to education by supplying content to those in need especially developing countries. This global rallying spirit is captured nicely in the Capetown Open Education Declaration. 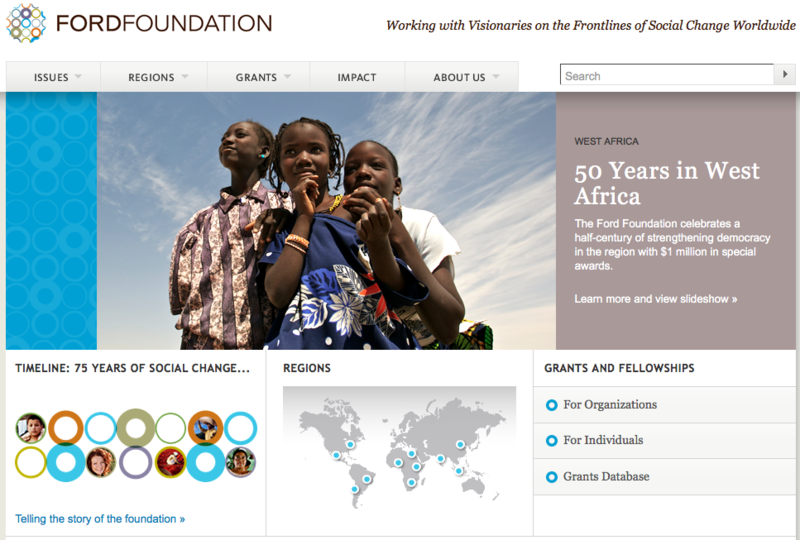 Another way of conceptualizing this is as a form of education philanthropy. With the BCcampus OER being funded by a provincial government the focus is more on serving the needs of students in BC. 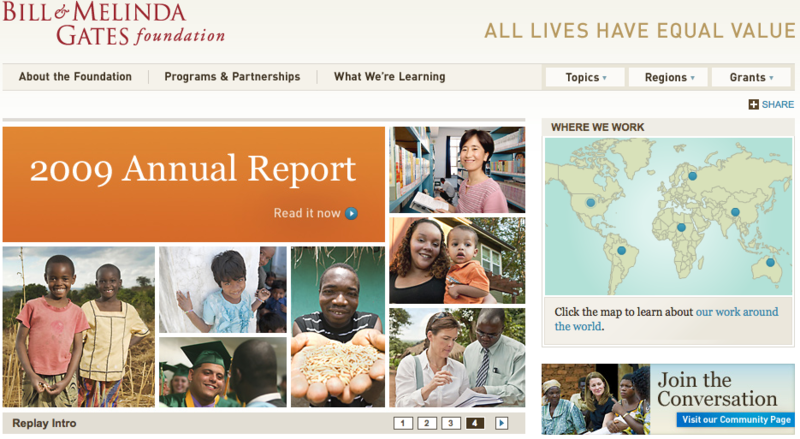 The global philanthropy aspect of OER has not been mandated. However, limiting the focus to the province rather than the globe may also limit the extent to which the open nature of these resources has an impact. An underlying principle of OER is that others are free to change and improve the resource but must share it back when they do so for the benefit of all including the original developer. A critical question for all OER initiatives is, “To what extent are OER being improved and modified by others and shared back to the benefit of the original developer and everyone else. ?” The startling answer at this point in time is little to not at all. The BCcampus OER initiative is unique in the licensing approach used. 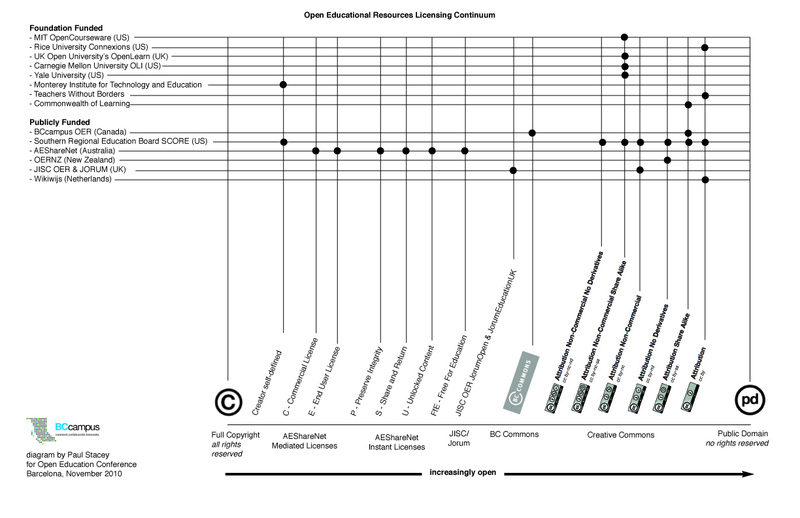 Foundation supported and globally oriented OER initiatives all mandate use of Creative Commons licenses. The provincial BCcampus OER initiative differs in that it offers developers license options. 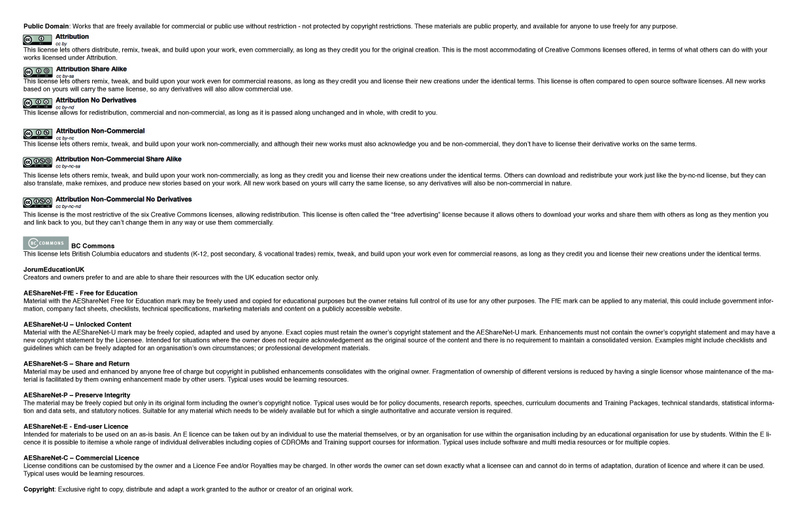 To make the OER open and shareable BCcampus OER developers are given licensing options of Creative Commons or BC Commons. Developers wanting to participate in the global OER movement and contribute to education philanthropy can go with Creative Commons. Alternatively they can choose the BC Commons license which provides for open sharing at the provincial level among all 25 public post secondary institutions rather than globally with everyone as provided through Creative Commons. An important principle in the BCcampus OER initiative is choice. Developers must openly share but they can choose to share regionally or globally. Participation in the global OER movement is recommended but not mandated. 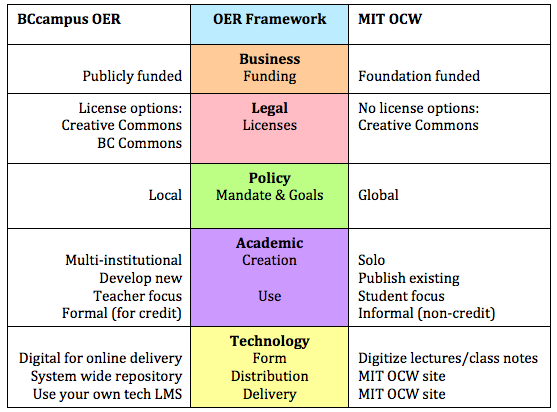 The BCcampus OER is one of the few who give developers license options and allow them to decide for themselves where they want to participate on the “open” continuum. To manage both global and local sharing BCcampus has deployed a Shareable Online Learning Resources (SOL*R) repository which provides a means for searching, previewing, and downloading OER. The resources that get developed through the BCcampus OER initiative are online learning resources primarily developed for deployment through learning management systems (LMS) such as Moodle, Desire2Learn, and Blackboard/WebCT. The multi-platform online learning form factor of our OER is another unique aspect of the BCcampus OER initiative. It has also complicated our OER effort enormously as the production of interoperable online learning resources is fraught with technical challenges exacerbated by LMS vendors who want to lock clients in to using their platform. One other unique aspect of the BCcampus OER initiative is that a portion of each round of funding goes toward developing professional learning OER resources for faculty and staff. This acknowledges the growing importance of complementing online learning development and delivery with educator professional development resources on how to effectively do so. As you can tell from the above I’ve been thinking a lot about what we are doing here at BCcampus and how it compares to what others are doing. I know from the many presentations I’ve given on the BCcampus OER initiative that some see our OER initiative as reprehensible for not mandating global sharing of the OER. I certainly believe in sharing of OER but I also believe in choice and the right for education developers to choose how openly they want to participate.